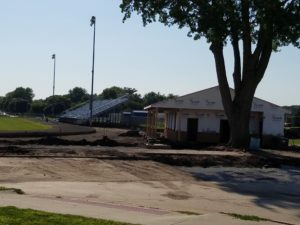 The Dewey Field renovation project for the Perry School District is making big progress, though it did get held back recently by the rain in June. The contractors still believe the project will be finished before the first home football game in late August, though Wicks emphasizes it’s weather-dependent. Concerning fundraising efforts, Wicks says they’re currently sitting at $220,000 raised of their $300,000 goal. Efforts are now ramping up to reach out to alumni, in hopes those individuals can get the funding over the hump. Also related to funding, at the recent School Board meeting, four change orders were approved as presented. Three were small changes that will increase the total cost, while the fourth decreased the price of the bleacher replacement. To learn more about the project, listen to Tuesday’s Perry Fareway Let’s Talk Dallas County program at RaccoonValleyRadio.com. See below for a list of the change orders. #1: Eliminate existing bleacher footing removal from scope of work; decrease of $1,280. #2: A four-foot high black vinyl fence in front of the south bleachers; increase of $4,400. #3: Patching proposed locations on 18th Street; increase of $3,004. #4: Three gates in the fence on the south side of the field; increase of $2,923.